1970 Mustang: Cerberus, Violetto Customs-Built "Hound From Hell"
It’s one thing to dream out loud and talk a big game, especially in the custom car scene. It’s quite another thing to design and complete a build, pack the car up, and make it to the biggest show in the country. All great pieces of art are formed in the mind of a patron, who in turn must find the right artist and commission them to build it. If the two don’t work in tandem, the end product will be forgettable. Custom car building is no different. More than any other event, the SEMA Show showcases the most ground-breaking and innovative builds on the planet, so both the patron and the artist better bring their best game. The path to SEMA requires the owner and builder to work closely together to see the project to the finish line. Even with the best-laid plans and scheduling plenty of time to complete cars, inevitably, unforeseen circumstances crop up. Challenges commonly arise to fabricate, acquire parts from suppliers, and assemble hand-built cars often leaving builders and car owners scrambling to get their latest creations ready in time. This was the case for car owner Scott McMurry and builder Telly Violetto, owner of Violetto Customs in Bradenton, Florida, who navigated many obstacles putting the finishing touches on their latest creation. The car was ready to go but alas, a few odds and ends were delayed, so last minute tweaks were completed at the 11th hour. As soon as the requisite parts were installed, the car was fired up for the first time, then loaded on the trailer for the 2,360-mile journey to the Las Vegas Convention Center. When they arrived, they were told they missed their admission cutoff window and were directed to the overflow lot outside in the north lot. Arriving one day late to SEMA, Cerberus had to park in the North Lot behind the convention center. Not to worry, thanks to John McLeod of Classic Industries, we found it! Not to worry, thanks to Classic Instruments head honcho John Mcleod, we were alerted to this muscular pony car and were more than happy to shine the light on this fantastic restomod Mustang. What we found was a true work of art. 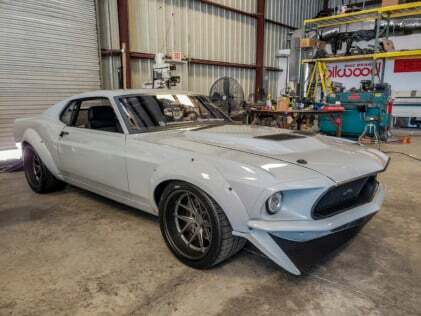 “Cerberus” is a 1970 Mustang restomod project tweaked to look like a 1969 model. This preening pony is a radical reinterpretation of the iconic late-’60s Mustang fastback. A full-tilt build with custom body panels, fender flares, rear deck spoiler, and tons of power. But before we tell you about the car, let’s step back to the beginning. 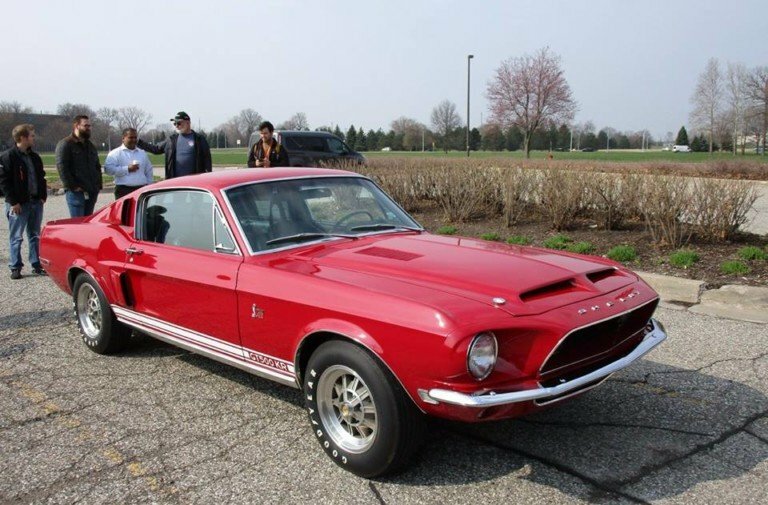 An engineer by trade, owner Scott McMurry had wanted a classic car since graduating college, with a 1967 Mustang fastback at the top of his list. Due to demand and rarity, a ‘67 just commanded too much money as a starting point for the vision of the car he wanted to build. Then in 2011, with the idea of having something to drive while he worked on it, McMurry found a running/driving Calypso Coral ‘70 Mach 1 in Florida. The engine was a 392 Sportsman (essentially a stroked 351 Windsor) which he planned to keep. Not being able to pony up (haha) for a ’67 fastback, Scott McMurry found this ’70 Mach 1 in Calypso Coral and planned to drive it while he updated it. Plans changed! Over the next five years, he gathered parts and started to take the Mustang apart. Seeing what state the car was in and realizing he was in over his head, the project came to a standstill. He was wondering how he was ever going to get it done. Sometimes you just need a little luck to come your way, and oh boy did it ever for Scott. Luck came Scott’s way, when he won this giveaway car from Speed Society. Eventually, he sold it to fund Cerberus. With capital secured from the GTR, Scott commissioned noted graphic designer Ben Hermance to pen the initial rendering. Meanwhile, a friend turned him onto Telly Violetto, who has two decades of car building experience under his belt, including cutting his teeth with the famed Ring Brothers. Scott initially proposed building the Mustang into a road race car, but as the project progressed, the build substantially changed from a track car, eventually turning into a high-end street/show car . . . and Cerberus was born. Originally, Scott wanted a road race car until he met Telly Violetto and thing drastically changed. In Greek Mythology, Cerberus is a three-headed dog with a serpent for a tail and snakes protruding from parts of his body. Known as the “Hound of Hades,” he guarded the gates of the Underworld to keep the dead from leaving. Ok, that explains the origin of the word, but to find out why, we went straight to Scott and asked him. Violetto Customs left no metal untouched on the car as the transformation took shape from sweet muscle car to all-out custom. From the earliest age, Violetto was immersed in car culture and enamored with cars. “My grandpa had classic cars,” he reminisced. “I tore apart a ‘31 Model A at age 8, and then I worked all the way through high school at a body shop. I had an automotive shop in Wisconsin for 11 years. “Then, the Ring Brothers saw me at SEMA in 2010 with a car I had built,” he continues. ”We worked out a deal, and I went to work for them for a handful of years. Then I started my own business about three years ago.” Violetto Customs’ mantra is to turn automotive dreams into reality, and it specializes in custom, one-off, complete builds. Cerberus is a testament to his talents. A project build as innovative and alluring as Cerberus needed a unique power plant. opted for a modified, supercharged Ford Performance 5.0-liter Aluminator crate engine that spools out 850 horsepower at the rear wheels. This Coyote-based engine features a long list of impressive hardware, including Mahle forged pistons, Manley H-beam rods, ARP 2000 rod bolts, and Boss 302 high-performance bearings. 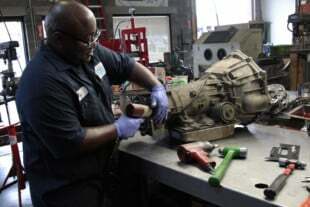 But McMurry wasn’t satisfied with a the stock Aluminator engine, so Coyote-swap specialists Power by the Hour in West Palm Beach, Florida, installed a VMP Gen II supercharger, upgraded cams, and a different oil pump gear. The VMP supercharger provides enormous flow to generate the impressive horsepower and torque figures. A unique custom car required hand-fabricated headers to route to resonators and MagnaFlow mufflers. A Tremec T56 Magnum 6-speed manual transmission dutifully transmits the torque to the rearend with reliable, bullet-proof shifting. A hopped-up Coyote Aluminator engine was fitted with a VMP Supercharger to get an impressive 850 hp at the rear wheels. Every inch of the car has been touched by Violetto. The fuel system itself is a custom design by Australian Aftermarket Industries. The car retains its unibody construction, but the chassis has been strengthened by Maier Racing chassis connectors, so Cerberus had a strong foundation for its high-performance suspension. Violetto fitted Cerberus with a Detroit Speed Aluma-Frame front subframe that features a stout cast-aluminum cradle, tubular upper- and lower-control arms, and rack-and-pinion steering for exceptional handling and ride performance. A Strange HD Pro that’s a cambered, full-floating, Ford 9-inch solid-axle assembly was slotted into rearend. To effectively apply all the available power, a modified Street or Track 3-link rear suspension with a Watt’s link and torque-arm setup was installed. The system firmly anchors the suspension and helps it maintain its geometry when under load. As a result, this suspension system improves lateral grip and vastly increases cornering speed. A Strange HD Pro full-floating 9-inch was setup with a 3-link suspension complete with Watt’s Link and a Chris Alston’s Chassisworks torque arm. The driveshaft runs up to a Tremec T56 Magnum six-speed. In order to stop the Hound from Hell, a dual-master-cylinder setup supplies ample hydraulic pressure for the braking system. Slotted and cross-drilled Wilwood Aero 6 Big Brakes with six-piston calipers up front and Wilwood Aero 4-piston Big Brakes in the back deliver exceptional stopping power. BF Goodrich tires are fitted to 18 x 12-inch three-piece Forgeline VX3C wheels that feature a deep-dish concave profile, GA-style spoke design, flat reverse-lip design, and a narrow rim register. Wilwood Aero Big Brakes sit nestled behind Forgeline VX3C Wheels and BF Goodrich rubber. Upon first sight, you quickly do a double take because the Mustang combines many different Mustang styling elements and alluring modern-styling cues. It’s a 1970 Mach 1 fastback styled to look like a ’69. Over the course of about two years, Violetto was a “one man automotive band” and spent considerable hours designing, fabricating, and assembling the car. Violleto spend a ton of time on the body panels. The rear taillight panel, quarters, fenders, and bumpers are fiberglass, while the trunk lid is carbon fiber. In particular, an enormous amount of time was devoted to fabricating and fitting the car’s panels. He sourced fiberglass front and rear bumpers. The chin spoiler and headlight buckets are from Agent 47. But the off-the-shelf parts had to precisely fit and align with the hand–fabricated parts. The trunk lid is carbon fiber while the rear-taillight panel is fiberglass. According to Violetto, “None of them fit. I had to cut, re-fiberglass, and reshape these parts. At one stage, Violetto had the core support, radiator, and all related bodywork completed, but owner McMurry decided he wanted a tipped-forward radiator rather than a conventional radiator layout. Violetto accommodated the change and re-fabricated the core support, swapped out the coolant hoses, and modified many other parts. In addition, the engine was re-positioned about 7-inches farther back in the chassis to improve weight distribution, and thus handling. Once the engine had been installed, Violetto then hand-fabricated the headers, which took about 10 days of work. The custom-built diffuser vanes have been fabricated over the custom fuel cell. You could just tell walking up to it there was a tremendous amount of work that went into fitting the panels and fender flares. The flawless body was finished in Avalanche Gray. Finally, the color. Scott deviated from his original plan. “Originally, I planned to paint in back the original color, Calypso Coral,” Scott says. “It was a really pretty color, but I decided that color would be a little too bright because the car is already kind of wild, so why paint it a wild color too.” He settled on a color that is really hot right now and it’s perfect for the build style. The Avalanche Gray paint is from Matrix Automotive Finishes and provides a muted yet attractive appearance. Violetto teamed up with Innerworks from Sarasota, Florida, to provide a personalized custom interior that was fitting for Cerberus. In competition-car fashion, the interior is simple, tasteful, and functional. The simple dash panel contains Classic Instruments gauges, which include an orange-faced tach, speedo, water temp, amp meter, and other gauges. A Tremec T56 relocation kit and shifter was sourced from Sikky Manufacturing and it handles the shifting duties. The interior was done by Innerworks in Sarasota, Florida. It is simple, yet elegant at the same time. The Classic Instruments gauges really stand out in orange behind the suede-wrapped steering wheel. Cerberus receives accolades and consistent attention from show goers — no matter where it is parked — even if it is the back lot at the SEMA show. The car has received a ton of buzz at show such as the Daytona Rod Run and it is absolutely on fire on social media. The patron and the artist stand proudly behind their creation. Violetto (left) is the builder, while McMurry (right) is the owner. With this mega-project completed, McMurry is pursuing other builds and has put Cerberus up for sale. He says, “It’s been a labor of love, but it’s been a painstaking process. I blew through the budget to build it, but I’m very fortunate to have been able to finish it, and be able to see literally every idea I had for the car come to fruition. There was no ‘oh man, if only I had a little more, I would’ve done this.’ We didn’t do that. Telly and I blew it out of the water, everything I wanted is in that car. Just like a true artist, Violetto looks for the next patron to take their vision and build yet another masterpiece for all to adore. We’ll be on the lookout!